Elephant poaching persists in southwestern Chad as poachers slaughtered more elephants on August 3, the second time in less than two weeks. In the first attack, the week of July 23, poachers killed 34 elephants, including 29 in Chari Baguirmi near a village called Bram and five in Mayo Lemie near Nanguigoto. In the second attack on August 3, it appears at least 4 or 5 elephants were killed and 2 injured, including a mother with three calves. 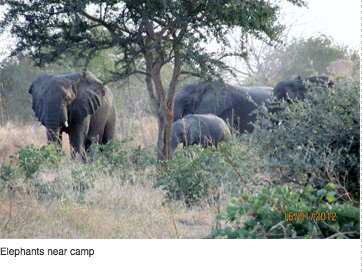 In addition, between five to ten baby elephants have been left alone in the bush. The exact numbers are unclear. Searching is difficult as poachers are still in the area, movement by truck is challenged by wet conditions, and thick vegetation limits aerial surveillance. A team from SOS Elephants is tracking the injured mother and plan to operate on her leg to extract a bullet once the area is secured. At that time, they will also assess whether she has enough milk for the calves. 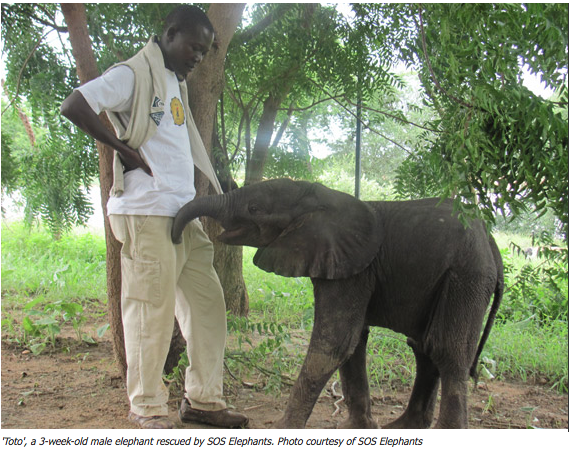 So far, the team has rescued one elephant calf, sleeping with the baby in the bush before leading him back to camp. They continue to search for others because infant elephants cannot survive long without their mothers. Young elephants are physically and emotionally dependent on their mothers for three to five years. They rely on their mother’s milk for their nutrition until age two, and are not fully weaned until five or six years old. The team also is monitoring the status of “Toto”, a 3-week-old male elephant rescued by the wildlife organization following the July 24 massacre. A neighboring herd adopted Toto a few days after the rescue, and a foster mother is now feeding him milk. SOS Elephants confirms that neither Toto nor his substitute mother were in the August 3 poaching incident. According to SOS Elephants, around 200 elephants live in the Chari-Baguirmi – Mayo Lemie area, which has no formal protected status. 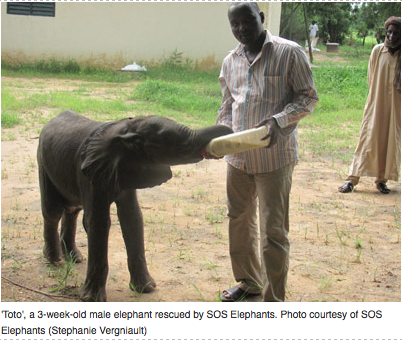 SOS Elephants monitors these elephants from their camp located in Mitau in Mayo Kebbi Est. Over the last two weeks, elephants in this area have crossed the River Chari near the camp several times for hours searching for a safe place. This is unusual behavior for the elephants. Normally at this time of year, they avoid the rain and mud by hiding in the small forests around the River Chari and do not come out again until October. The perpetrators remain at large despite a large government search party of 200 soldiers. It appears the poachers are heavily armed and have accomplices among the local population. Three days ago, the paramount chief, government soldiers and administrative authorities spent the day visiting villages near the forest where the latest poaching occurred and promised them an incentive to denounce the poachers. Environmental organizations working in the region, including the African wildlife law enforcement organization LAGA (The Last Great Ape Organization), the Wildlife Conservation Society, and African Parks Network, believe the most likely way of apprehending the poachers is through receiving information on their whereabouts from the local population, and are planning to offer a substantial reward.